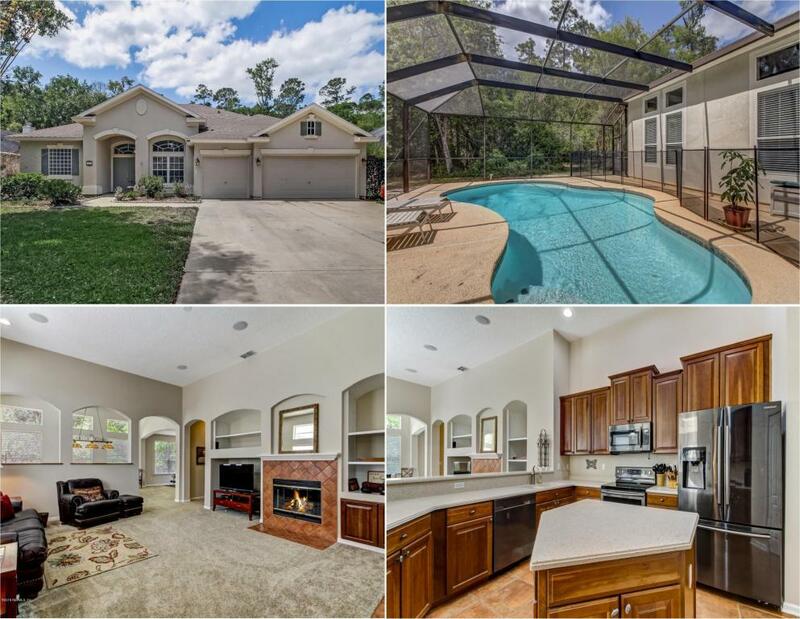 Spacious POOL HOME nestled on .29 acre lot in a no CDD FEE neighborhood that borders woods in back. Designed w/a 3-way split 1-story floor plan offers 4 bdrms & 3 baths, combined Living/Dining Rm, lrg office behind French doors w/built-in shelves, & a huge 1st floor Bonus Rm/Game Rm plumbed for a wetbar. Open Kitchen features 2 yr old quality Samsung appl's, Corian counters, 42'' upper cabinets, food prep island, breakfast nook & bar. Screen enclosed pool & lanai overlook a natural wooded area that creates privacy while relaxing or swimming. Extras include: a fireplace & built-in entertainment niches/shelves/cabinets in the Family Rm, architectural details, volume ceilings & a 3 CAR GARAGE. Oak Harbour is a small St. Johns County community w/low HOA fee in a top rated school district. WOW!LOADS OF CUSTOM BUILT-IN'S MAKE THIS HOME SPECIAL! Per Seller, existing survey shows a "25 ft. Perimeter & Undisturbed Upland Buffer" abutting the lot behind them, which is located in Mallard Landing Subdivision.